I will just repeat a little bit from how the tracking script integrates with Google Analytics. Tracking script simulates virtual directory hierarchy to Google Analytics so you can use it's reporting capabilities effectively. This hierarchy always starts with /asclick directory, is then followed by Ad group type or custom type(channel) name and the final thierd level of this hierarchy is AsSense Ad URL address or AdLinks Keyword (only available on IE). So simple AdSense click hit would be /asclick/NavigBanner/www.DirectRelief.org for NavigBanner Ad type and DirectRelief Ad. Comparing time ranges is one of the neet features offered by Google Analytics user interface for many types of reports. It does precisely what it says, it compares data for two specified time ranges. When clicking icon highlighted on the picture, the second date picker control appears so you can select second time range to compare the data to. 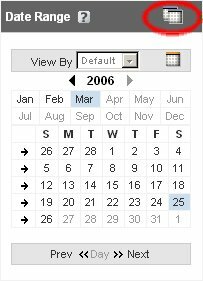 This feature allows you to view selected data over time. It's activated by clicking the highlighted icon and selecting "Data Over Time" option. The graphs are displayed in new window. This is the most basic report and is also provided by integrated AdSense reporting. If you want to know absolute number of AdSense ad clicks, use Goal Tracking report (Content Optimization / Goals & Funnel Process / Goal Tracking). There you can see number of clicks graph over selected period and also total and average number of clicks. If you're rather interested in click through rate (CTR) just use the next report Goal Conversion (Content Optimization / Goals & Funnel Process / Goal Conversion). Just note that this is different CTR as oposed to AdSense reports (it should be higher). Google Analytics shows you visitors CTR as oposed to page views CTR showed by AdSense reports. Knowing how different Ad types perform is key condition for successfull AdSense sites. It's possible to track different channels with AdSense integrated reporting, but with AdSense tracking script and Google Analytics it's easier and more powerfull. Just navigate to Content Drilldown report (Content Optimization / Content Performance / Content Drilldown). And navigate further to asclick subtree by clicking on it's icon. Now you can see different ad types in the table and also their number of visits (unique vistitor clicks) and page views (ad clicks). You can see on this sample picture that i have used custom channel tracking and reporting. If you navigate even further and click on concrete ad type, you can even see how different banners or AdLinks keywords perform and what are your visitors most interested in! If you look at Pageviews and Visits numbers in the sample, they are the same. But in real world use, they will probably be different. Pageviews can be interpretted as absolute number of Ad clicks, but the number in Visits column would not count repeated clicks by single visitor. Avg Time is also very interesting. This is the average time the user stayed on the page (the page he was sent when clicking at the Ad) in case he then returned back to your page. 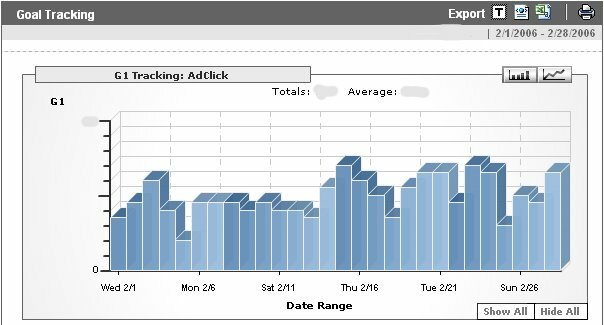 You can see what Ads your users don't like and are comming back to your pages fast. % Exit show you how many users did not come back to your pages at all and stayed on Ad page (we are of course talking about one user visit). It's also possible to get an overview what ads are clicked the most without navitation Content Drilldown structure. We will use Goal Verification report for that (Content Optimization / Goals & Funnel Process / Goal Verification). The sample report is visible on the following picture. There is clearly visible what Ad URL's and Ad types are clicked most. It could also be very interesting to know what web pages generate most of the AdSense clicks. This type of report is also possible to do in AdSense integrated reporting, but it requires a lot of manual work creating url channels for different web pages. Google Analytics offers much simpler way to do this. We will use integrated goal tracking for this report. Specifically Defined Funnel Navigation and Reverse Goal Path reports (Content Optimization / Goals & Funnel Process / Defined Funnel Navigation). As we have not defined any funnel navigation path you can see the AdSense clicks directly in the first report. Note that only 5 most effective pages are displayed on screen. If you want to see all pages use text export by clicking the T button on top. You can also use Reverse Goal Path report. There you can see what navigation paths lead to most AdSense clicks. Do you ever wanted to know if visitors with highest conversion came from Search Engine of some refering site? It's also possible with Google Analytics. There are two subtypes of this report. The first type teels you what medium has the highest click through rate (CTR) and the second one is about absolute number of AdSense clicks. We will use Medium Conversion report and goal tracking for the first type (Marketing Optimization / Marketing Campaign Results / Medium Conversion). organic indicates visitors referred by an unpaid search engine listing. referral indicates visitors referred by links which were not tagged with any campaign variables. 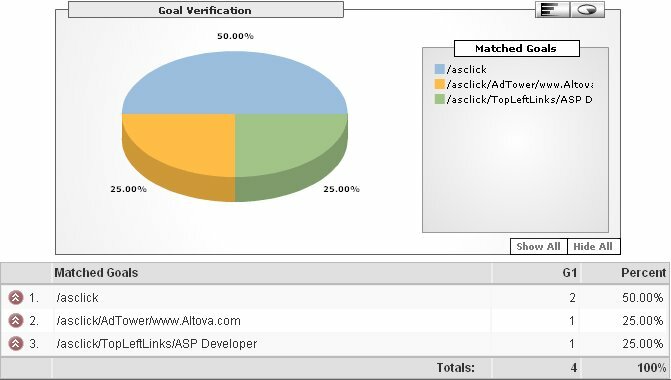 (not set) indicates visitors referred by links which were tagged with campaign variables but for which the medium variable was not set. (none indicates visitors who visited the site by typing the URL directly into their browser. The most interesting column for us is G1/Visit. It shows how many users comming to our pages through specific medium actually clicked on AdSense Ad. You can further navigate the hierarchy to see for example which search engine has higher conversion rate for you. There is also very similar report for refering sites. It's Referring Source report (Marketing Optimization / Visitor Segment Performance / Referring Source). We will learn about the second type of report in Advanced Cross segment reporting chapter. Have you ever wondered what queries that brought visitors to your web pages from search engine convert to most AdSense clicks? It's also possible with AdSense tracking script and Google Analytics. We will use Overall Keyword Conversion report (Marketing Optimization / Search Engine Marketing / Overall Keyword Conversion). I have no sample picture for this type of report yet, so i will only explain this one. It's very similar to previous type of report. The only difference is there are no traffic types but search queries in the left most table column. Are you interested in what country came the most clicking visitors from? What language do they speak? This can also be answered by Google Analytics. Just navigate to Geo Location and Language reports respectively (Marketing Optimization / Visitor Segment Performance / Geo Location). There is an old known report prepared for you. You can further navigate the Geo hierarchy to see more specific information. The language report is very similar to this one. There are a lot of nuggets hidden in this Google Analytics advanced feature. You can cross segment /asclick directory (or any other) from Content Drilldown report (Content Optimization / Content Performance / Content Drilldown) to many other values. The most powerfull feature of these reports is, that they are not restricted to simple AsSence click goal. You can cross segment individual Ad units and event individual Ad URL's! Those were the options Google Analytics offers to you for AdSense click reporting. Do you have your own favorite report? Just feel free to leave me a comment. The AdSense tracking script presented here is a result of my research. You can download free astracker.js script just now. Please first read the instuctions how to install this script and how to connect is to Google Analytics. Tracking of clicked ad types - Type of ad unit is tracked with click. You can also setup custom type for each ad unit on page. Tracking clicked URLs and Keywords - URLs or AdLinks keywords are tracked together with click. Support for custom ad channels - You can easily setup custom channel (type) for each ad unit. These are the limitation i have faced when using this script. If you know about any other, please leave me a comment and i will add it. Clicks resulting from AsLinks search results ads are not tracked - This happens on google seach server, so it's simply not possible to track those clicks. Keyboard "clicks" are (usually) not tracked - When tabbing and pressing enter on AdSense ad, this click won't be tracked unless mouse pointer if also in AdSense IFrame. Possible false keyboard clicks - This is the oposite of above. When the mouse pointer is on AdSense IFrame and the user uses TAB key to focus some of AdSense IFrames, false click could be reported. False click reports when using two mice - Yes, this could really happen :)) When one mouse poiter is in AdSense IFrame and document unload event occurs (for example when some (non adsene) link is clicked by second mouse), false click could be reported. The passive listening method used by this tracking script does not allow for 100% accurate click reporting. When compared to AdSense, my results are usually about 10-15% lower in Google Analytics goals. The limitations i know about are already mentioned in some of previous paragraphs. I would be really interested in how this script performs for you (especialy for higher traffic volumes). Integration with Google Analytics is achieved by manually calling urchingTracker when user clicks on AdSense Ad. Tracking script simulates virtual directory hierarchy to Google Analytics so you can use it's reporting capabilities effectively. This hierarchy always starts with /asclick directory (unless you modified this value), is followed by Ad group type or custom type(channel) name. The final thierd level of this hierarchy is AsSense ad URL address or AdLinks Keyword (note that this is not available for clicks from Firefox browser). or /asclick/NavigBanner/www.DirectRelief.org (if you use custom adgroup names). The setup procedure constists of two parts. First you have to setup your web page to track AdSense clicks and report them to Google Analytics. Second part is about tweaking Google Analytics settings a bit to ease interpreting click retults. And please be prepared to wait at least 24 hours before some AdSense tracking hits appear in your Google Analytics interface. Download astracker.zip file containing all required files. Optionally tweak the page to support custom channel reporting - see Advanced Settings for further info. This procedure is not required, but it eases access to some type of reports so it's highly recomended. I will assume you followed this procedure in the examples how to interpret tracking results. 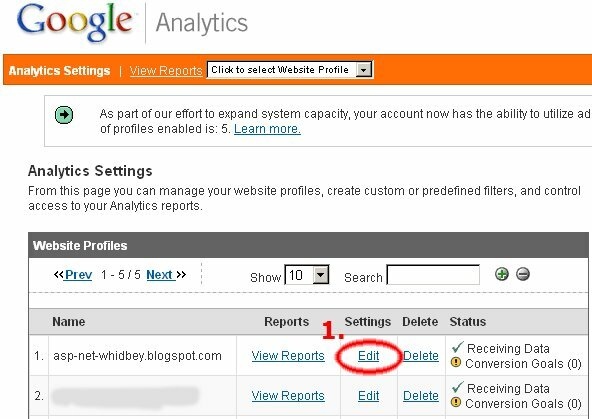 Log on to your Google Analytics account and open settings for desired web page by clicking Edit link. You should see "Conversion Goals and Funnel" pane with four goals (G1-G4). Click on the right Edit link for first goal (G1). Now scroll down click Save Changes button and we are set. From now on adsense clicks on your web page will be considered goal hits in Google Analytics. This AdSense tracking script supports custom channel tracking by wrapping adsense code in HTML element with specially predefined id. If you wrap your AdSense code to HTML element with id prefixed as asc_ (AdSense Contianer), the tracker will use the remaining portion of id and report is as Ad type. So for example if you wrap AdSense HTML code in div element with id asc_NavigBanner, the tracker will use "NavigBanner" instead of default "234x60_as" when tracking clicks for this Ad group. Google Analytics is far more powerfull when compared to AdSense reporting capabilities. But some of the reports are also possible to produce with AdSense reporting and in such cases you should always use those reports as they are 100% accurate. Also there is no actual ad revenue and eCPM tracking in Google Analytics reports so you will still have to use AdSense center for this. How many users clicked on AdSense ads? If you want to know absolute number of AdSense ad clicks, use Goal Tracking report (Content Optimization / Goals & Funnel Process / Goal Tracking). There you can see number of clicks graph over selected period and also total and average number of clicks. How do I know what ad types users click the most? As usually Google Analytics has a report prepared for you. Just navigate to Content Drilldown report (Content Optimization / Content Performance / Content Drilldown). And navigate further to asclick subtree by clicking on it's icon. Now you can see different ad types in the table and also their number of visits (unique vistitor clicks) and page views (ad clicks). How do I know what pages generate most clicks? This one is also quite simple. We will use integrated goal tracking for this report. Specifically Defined Funnel Navigation and Reverse Goal Path reports (Content Optimization / Goals & Funnel Process / Defined Funnel Navigation). As we have not defined any funnel navigation path you can see the AdSense clicks directly in the first report. Note that only 5 most effective pages are displayed on screen. If you want to see all pages use text export by clicking the T button on top. Today i came across some very interesting arcticles by Scott Mitchell Custom Paging in ASP.NET 2.0 with SQL Server 2005 and Sorting Custom Paged Results. I was looking for such complex info for a long time and those arcticles finally supplied all infromation together at one place. As a bonus you get some basic speed comparisons of different paging and sorting methods. This property turns on/off paging support for this data source. If you enable paging for ObjectDataSource control you also have to define SelectCountMethod, StartRowIndexParameterName and MaximumRowsParameterName properties. This property contains method name (must be static, parameterless method of TypeName type) used for geting total count of paged items. This is the name of parameter for SelectMethod specifying starting page index. Similar to StartRowIndexParameterName this parameter specifies how many rows to return. When using custom sorting for ObjectDataSource, this property contains name of the parameter that specifies row sorting. This is my Bussiness Layer GetFuns method. It return list of all funds and has three parameters. First is starting data row, second is how many rows to return and the last one is our sorting expression. This method first tries to translate sortExpression from Bussiness Layer notation to Data layer notation (more about it later) and after that retrieves data from underlying Data layer. The sort expressions comming from this Gridview are ID, Name and ISIN but Data Layer works internally with column names FND_ID, FND_NAME and FND_ISIN. Translation from one notation to another is handled by CBO's class static method TranslateSortParams. It uses reflection on FundInfo class properties which are decorated with DatabaseField atributes to translate from one notation to another. As noted in original arcicles, for large result sets this custom paging is roughly two order of magnitudes faster than the default paging. It's implementation is not so straight forward as default paging and sorting but for large result sets together with correct database indexes it works like a charm. Definitely have a look at those arcticles too! The world of Web applications is quite different from Windows forms. The solutions that perform great for Windows applications are sometimes quite pain when developing solution designed for the web. ASP.NET 2.0 introduces new feature called declarative localization expressions. It allows you to easily localize web pages and by default it uses .resx files stored in App_LocalResources and App_GlobalResources folders in your web application. Visual studio 2005 supports easy resource creation for each web page by "Generate local resources..." menu entry. Localization to different language/culture is so simple as copying and renaming this automatically generated file and adding desired locale code to it's file name. The resource files (satelite assemblies) are locked all the time, the application is running (it's not easy to update there localized resources). It's difficult (if not impossible) to manage these resources directly from your own web application (for example let the user create new localization or edit existing ones on ther own). But wait, we are in ASP.NET 2.0. Many thing can be extended and so this Resource provider can be. All you need is simply create your own ResourceProviderFactory based on ResourceProviderFactory class and modify web.config file. Now imagine, you could have your resources stored in Sql (or any other) database. The IResourceProvider interface that is return by these two methods contains definition for following method and property. In past few days I was looking for a solution how to display and control 3D DWF files using Autodesk DWF viewer 6.5. I have faced so many problems and also found some solutins that I've decided to share with You. But first some background about DWF viewer for those who haven't seen it before. Access data integral to engineering and architectural design review including drawing scale, precise design coordinates, sheet set details, and object and markup properties. Easily view and navigate drawings, maps, and 3D models without the software that created them. View and print engineering and architectural files accurately with the same rendering engine as AutoCAD® software. Many Autodesk products support saving to DWF format: AutoCAD® 2006, Autodesk® Architectural Desktop 2006, Autodesk® Building Systems 2006, Autodesk® Civil 3D® 2006, Autodesk Inventor® 9 and 10, Autodesk® Land Desktop 2006, Autodesk® Mechanical Desktop® 2006, Autodesk® Revit® Building 8, Autodesk® Revit® Structure, Autodesk® VIZ 2006, Autodesk® 3ds Max® 8. So what those parameters mean. ToolbarVisible set to False hides user toolbar (on top of viewer), UserInterfaceEnabled parameter controls right mouse click context menu and src attribute points out to DWF file being visualized. The code listens for DOCUMENT OnLoad event for ADViewer object and sends NAVBAR disable command to it. This is not documented in official API and may change in feature releases of Autodesk DWF viewer. So are the following commands that we will use. The whole 3D API is not yet officially supported. fitToWindow function is quite easy, it fits current object to occupate whole window. The setView functions sets standard camera view (Front Top Left) and showAll function shows all objects.